Lebananese investigators take photos of a building after an explosion Sunday in which two people were killed. (CNN) -- An explosion in a Beirut, Lebanon, suburb killed two members of the Hamas militant group and injured two others, a Hamas representative announced Sunday. The Saturday night blast went off in the basement of a building used as a parking garage near the site of a Hamas office, said Osama Hamdan, a Hamas representative in Lebanon. Hamdan said bodyguards Hassan Haddad and Bassel Joma'ah were killed in the blast. Hamas, an Islamist fundamentalist group, is based in the disputed territory of Gaza. The blast site in Haret Hreik, a southern suburb of Beirut, Lebanon's capital city, was cordoned off by Hezbollah, a political party in Lebanon. 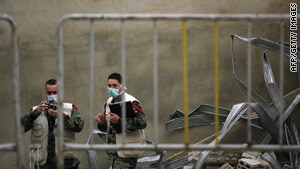 Lebanese security forces inspected the blast site but officials could not be reached for comment. Hamdan did not detail the nature of the explosion.